UK prime minister Theresa May is set to deliver her speech to the Conservative Party conference in Birmingham later today. As George Kassimeris explains, the event has been dominated by divisions in the party over Brexit, with many observers predicting this could be May’s last conference speech as prime minister. He argues that while she might not lead her party into the next general election, she still has the authority to define the parameters of what follows her and the future of the UK’s relationship with the EU. Whatever happens in Birmingham today, this should be Theresa May’s last conference speech as Prime Minister and Tory leader. She is unlikely to give the performance of her career but hopefully there will be no repeat of the trauma and embarrassment of her Manchester 2017 conference speech where a prankster got onto the stage to present her with a mock P45 on live television. And, hopefully, no letters will this time start to fall off the conference platform and the obligatory optimistic slogan behind her will remain intact for the entire duration of her speech. And she will experience no voice malfunctioning issues either that would make it almost impossible to watch or listen to what she is saying. It was the most calamitous conference speech anyone can remember and it was difficult not to feel sorry for Theresa May at that moment when everything that could have gone wrong did for the prime minister, who had arrived in the north politically vulnerable and desperately needing all the luck and reassurance she could get from her party after the humiliating election result four months earlier. The Manchester conference was seen as an opportunity for the embattled PM to make a fresh start, reassert her political authority and provide a vision for Brexit Britain. Well, the opportunity was squandered and it has been an agonisingly slow-motion car crash ever since. Napoleon once remarked that he would rather have a general who was lucky than one who was good. The problem for Theresa May, the Conservative party and the country as a whole in this critical juncture is that she is neither lucky nor is she a good leader. Time and again she has failed to demonstrate even the basic political skills needed to be prime minister, let alone a Brexit prime minister. And I’m not talking here about her inability to project some degree of charisma and an easy and attractive persona, traits so much in evidence with David Cameron, her predecessor. So much in politics after all, as in all human affairs, is about feeling sufficiently comfortable to make others feel likewise. Her robotic, zero-empathy approach is clearly a disadvantage in these confusing, uncertain, Brexit-afflicted times. 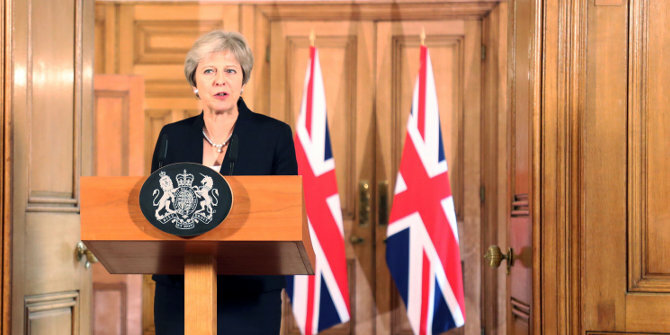 May might have achieved her dream of becoming prime minister, but her tragedy is that she was destined to be the prime minister who delivers Brexit, the UK’s greatest national challenge in modern memory. Brexit was always going to be an ugly, chaotic affair and it would have needed an extraordinary politician and a transformative prime minister to navigate the brutal dilemmas caused by Cameron’s colossal misjudgement in promising a simple in/out EU referendum. May, who landed the top job by an ‘odd chance’ to borrow the Economist’s less than charitable phrase (even though she personally voted Remain) sadly is neither extraordinary nor is she transformative. She, in fact, compounded Cameron’s error first by prematurely triggering Article 50 before her party had reached a broad agreement on the terms of exit and then by holding a disastrous snap election damaging in the process her political authority within her notoriously ruthless party. The main reason why May is still politically alive and in Downing Street is because her party is entirely consumed by a cruel, vicious civil war over the future of Conservatism and the shape of the post-Brexit settlement, and is thus unable to unite around a successor. To be fair: May is entitled to feel exasperation with the hand that she has been dealt, with her toxically fractious party and with the belligerent Brussels EU leadership, but when everything is said and done she knew what she was getting herself into. As March 2019 draws nearer, the British premier, if she does manage to stay on, will have to bite the bullet at some point and decide between a soft Brexit that would split her party and a hard Brexit that would split her country. This is the central fact of British politics today and it cannot be manipulated out of existence even by the most accomplished squarer of circles. Maybot, as she is affectionately known among political journalists, may lack the bravery of a transformative leader and she may never be allowed to lead her party into the next general election, but she still has the authority to define the parameters of what follows her. It will be to the great detriment of her country if she fails to find the courage to seize it. How interesting it is that on this blog there are two adjacent articles, one about “Merkeldämmerung” and one “The slow downfall of Theresa May”, In both cases it is obvious that the current regime is in trouble, but who is going to replace it? Both May and Merkel are, for all their faults, fairly centrist, so a coup from the left or right wing of their parties is going to be difficult to pull off. Perhaps the most likely scenario is that one or both get fed up and resign, leaving their parties to fight over the succession. In that case it’s anyone’s guess who will have to clear up the mess.